Built with a women's specific cut that provides unique comfort, durability and speed! The Women's specific Zone3 Aquaflo Triathlon shorts are uniquely built for the female cut to ensure comfort and speed. Built with Aquaflo technology that minimises water-drag by preventing water absorption thanks to the Teflon coating. Premium Italian leg grippers prevent the shorts from riding up whilst you're on the bike or run. The Tri-Lite-Pad is designed by Zone3 to provide a high level of comfort without being too thick and heavy when you are swimming. You will also find the featured Airflo design helps to quickly and efficiently remove moisture build-up between your skin and the suit which makes sure you remain feeling clean and comfy when you're working hard! A 3.5cm elastic waistband has been added on to the shorts for an extremely comfortable and supportive fit. 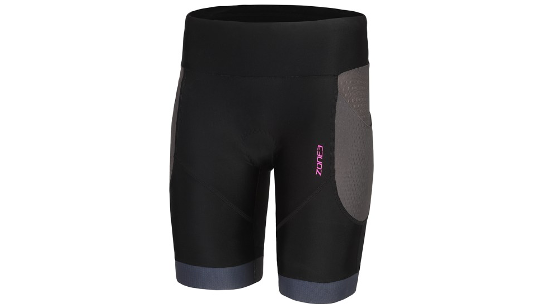 The shorts are designed to ensure nothing will be exposed whilst on the bike and a drawstring cord is added to accommodate a range of waist sizes and ensure optimum fit. A tried and tested race-specific triathlon pad providing fit and comfort unlike any other on the market. Minimising water absorption and providing protection during the cycle, without impeding your swim or run. Also, new fine-line stitching to further reduce any irritation. This pad has been used since 2015 and the reviews have been fantastic.